PM Netanyahu threw a political bombshell into the national arena, offering Kadima membership in a national unity government. Prime Minister Binyamin Netanyahu threw a political bombshell into the national arena, offering Kadima membership in a national unity government. 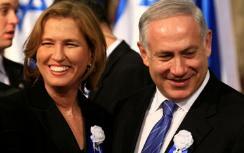 He made the offer in a Thursday afternoon meeting with Opposition Leader Tzipi Livni. The move would apparently save Kadima from an internal split; one MK has already announced his leaving Kadima, and six more – unnamed – have initialed an agreement to do so. Livni has come under great criticism for her leadership of the party in the opposition, and the party’s #2, Sha’ul Mofaz, earlier in the day demanded new elections for party leader. Livni’s first response: “I have always said that if it’s genuine, it is worth discussing.” She has staunchly opposed joining the Netanyahu-led government from the day it was formed, demanding nothing less than a rotating premiership with Netanyahu. If Kadima joins the government, this would give Israel one of its largest government coalitions ever, with 102 Knesset Members, while the Opposition would comprise only 18 MKs (including 10 Arabs): four each from the National Union, Raam-Taal (Arab), and Hadash (Arab-Jewish) parties, and three each from Meretz and Balad (Arab). The official Knesset position of Head of the Opposition would be assigned to the candidate who wins a majority of opposition MK votes – and would therefore likely be an Arab Knesset Member. Netanyahu said he would give Kadima four ministerial positions in the Cabinet, without portfolios. This would bring the number of government members to 34. The Kadima Knesset faction convened on Thursday afternoon for a previously-scheduled meeting. The original objective was to discuss ways to prevent the party from splitting, but this will apparently be replaced by a discussion of Netanyahu’s offer.